How can you resist that silly face. I’m predicting a group-hug on this post. Can I just say Abracadabra is super hot? No software for work at the moment… so I’m watching clips on YouTube. No need for office time for YouTube surfing, right? Don’t miss out on Steve’s rant. I still think I’m a combo of Sally, Susan and Steve all together. is not really that memorable. It’s funny, it’s got loads of moments for laughs — my dad even said so while saying it’s just a film to watch for fun with the kids. My favorite – most surprising – moment was actually with Scarlett Johansson playing Russian-non-Russian super heroine Black Widow (aka. Natalie Rushman, aka Natasha Romanoff) taking on a dozen or so guards as Happy Hogan (played by Jon Favreau, who directed the film) was taking one of his own. But then again, it was because I literally burst out laughing, not because I thought it was the coolest thing ever… this is the best Johansson has looked on screen in a really LONG time. 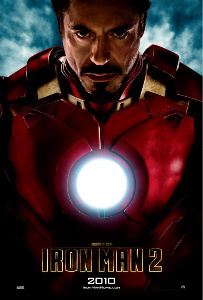 Iron Man 2 – for the ones who don’t follow anything about superhero films – follows Tony Stark after he’s announced to the world that he is Iron Man, and that he’ll be the keeper of world peace, as he cockily says that he’s managed to privatize it. However, as he keeps using the Iron Man suit, his body begins a toxic transformation as the material used to power it is… well, toxic. So as Stark processes the idea of dying, he begins setting his business affairs in order, and living a self-destructive last-days. Little did he know that an enemy is ready to use the Stark’s Iron Man tech to disrupt “world peace”. Visual effects were their usual top-notch selves, except when Rhodey (played by Don Cheadle, replacing Terrence Howard) was using a suit… there was something funky with his moving and flying… maybe because it’s meant to not be as cool as Iron Man.